It’s a middle-sized seabird. The upperside is blue-grey and black. The underside is white.Tarsus and web are bicolor pink and black. The contrast between the clear back and the wings is more marked on juveniles than adults. Sometimes, fledgling birds wear some duvet. This species has been protected since 1989. Its population is estimated to be between 6,000 and 8,000 breeding couples (LE CORRE, M. & SAFFORD, R. 2001), maybe more (unpublished data). 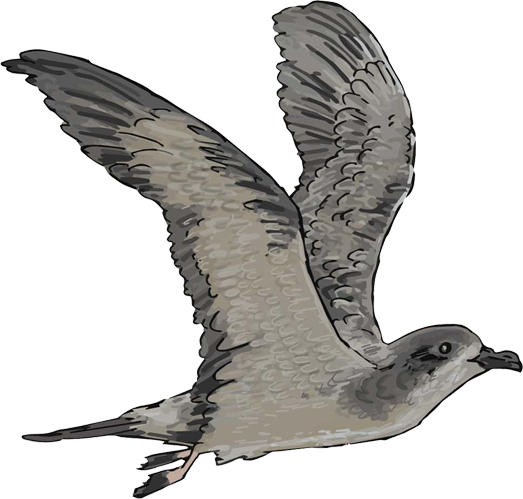 Barau’s Petrel is monogamous. Pairs are breeding each year in the same burrow. This bird breeds during the southern summer: it arrives in the colony in September, lays eggs in November, which hatch late in December and the chicks fly away around April. Adults leave Réunion just before that, in March. After the breeding season, adults spend almost 6 months feeding at sea (from April to September) and do not return to land during this time. We do not know the migratory route of young birds. The young petrel come back to the colony around the age of 3 to 6 years. The survival rate of adult birds is very high. This migratory bird feeds on squid and epipelagic fish*. * fish living within 200 meters of the ocean surface. 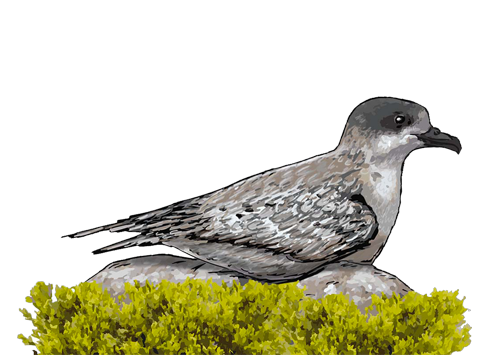 Barau’s Petrel is the only petrel visible during daylight in Reunion Island. Along with the Hawaiian petrel, this seabird is the only one to breed at such high altitude. Both chicks and adults are face a severe threat from cats and rats, which also eat petrel eggs. A single cat (i.e. a stray cat living in the remotest areas of the island) can kill up to 90 petrels per year. Petrels lay only one egg per year. These predators significantly reduce the population of the species. Light pollution is another major threat to petrels besides being dangerous for turtle and human health. Urban lights cause hundreds of fledging petrels to become stranded each year. That is why in April, a “Nights Without Lights” event takes place in Reunion. The event sees municipal lights turned off which can help fledging petrels reach the sea. Petrel chicks need to reach the sea, but bright lights have the same effect as the reflection of the stars on the sea surface. This causes the fledglings to become confused. Once on the ground, petrels are unable to take off again unaided. They need to be brought to the edge of a cliff in order to attempt to fly out to sea again. The SEOR rescue network was created to help and treat stranded birds, before returning them to the wild. It needs support in order rescue the growing number of stranded birds. Garbage left in the environment encourages predators: cats and rats feast on rubbish left in the wild, their numbers are consequently increasing. Waste is not just plastic packaging, but also the remains of food. Fruit, peelings, an apple core or even a lychees stone are waste and strongly impact the island’s environment. This waste does not have any benefits to nature, and contrary to popular belief, they do not decompose because they are eaten by rats and cats.